My house has approximately 2,500 square feet of roof area. The gutters empty through six downspouts. I have been interested in rain harvesting for some time now and this year’s projects have significantly escalated its priority. My current watering needs consists of 30 fruit trees planted at the orchard, 5 fruit trees planted in my front yard, 40 square foot vegetable garden in my side yard, and another 200 square foot vegetable garden in my backyard. While I am employing the use of heavy mulching at the orchard and in at my home garden, I was still interested in harvesting as much water as possible since I am interested in maximum yield from my garden and my orchard. Most importantly, since there is no water source at the orchard, I very much desire to get the trees established as soon as possible so they can begin to sustain themselves on ground water. Therefore, several months ago, I acquired seven 330 gallon IBC totes. Most large volume containers, run about $1 per gallon. So, at a price of $90 each, these were definitely much more affordable. 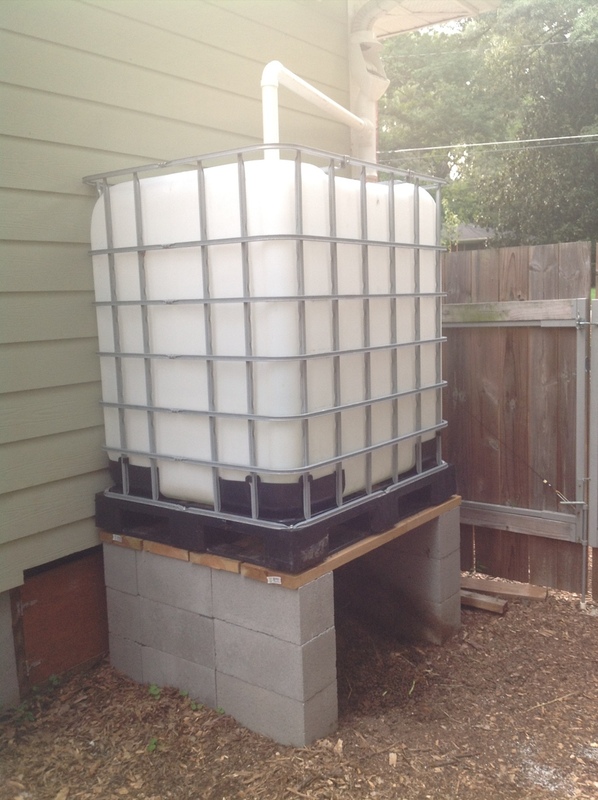 After I setup the first one, I actually found that the IBC totes lent themselves very well to rain harvesting. 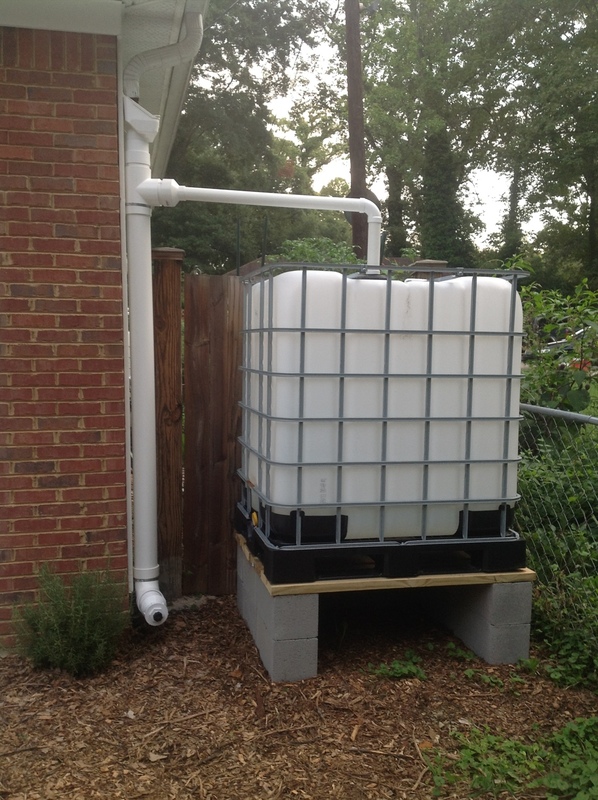 The built in inflow and outflow openings really made it easy to repurpose these as rain totes with the addition of a few PVC connectors readily available from any major hardware stores. After some research, I also found that it was really simple to get these totes connected to the gutter for rain harvesting. 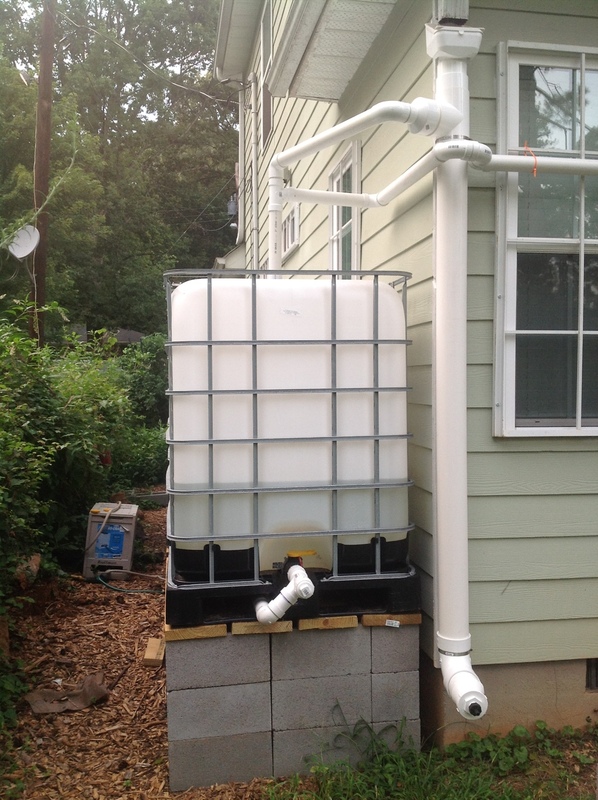 To accomplish this, I’ve decide to leverage some well conceived gutter filters and first flush systems which were specifically designed for rain harvesting. My previous post demonstrated the installation of the Leaf Beater and First Flush system. 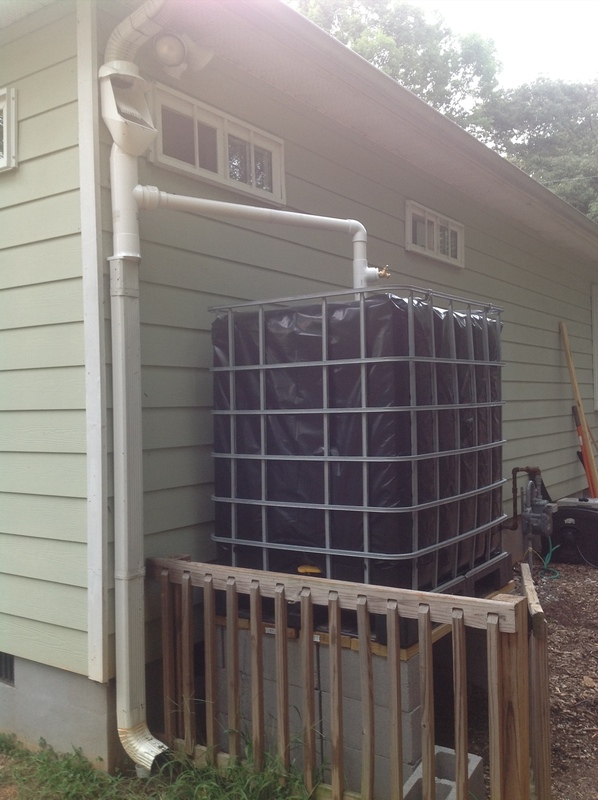 This post shows the completed installation of the 7 IBC totes which are the final components of my rain harvesting system. This was the first tote that I setup. It’s hooked up to a different rain harvesting product called Clean Rain Ultra. 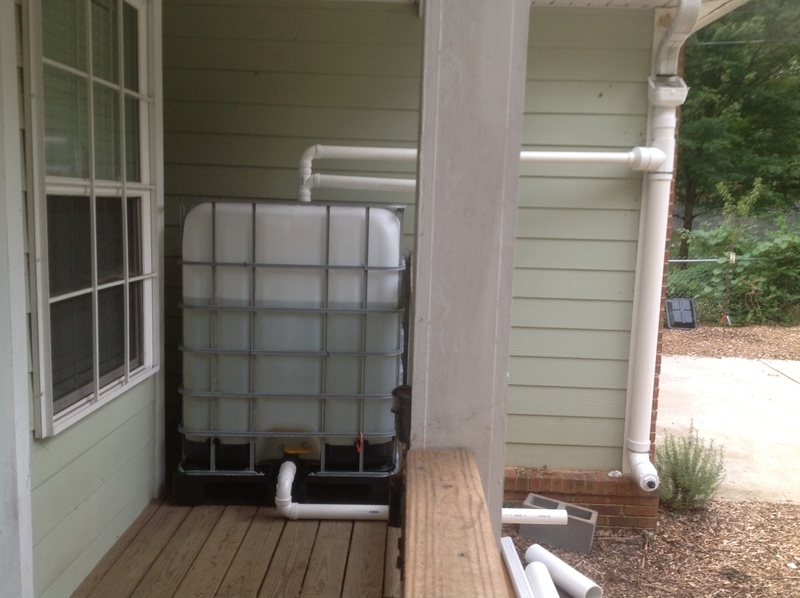 This product combines a leaf filter, fine debris filter, and a first flush system all into a single unit. While it’s well-designed, I didn’t like the multiple moving parts which will eventually require maintenance or replacement so I only installed two of these units. My first IBC tote was also wrapped in black PVC film. This is meant to keep the sunlight from penetrating into the tote and causing algae growth in the water. This tote wrap is a prototype. I am still testing with other methods to see if there are better options. Despite only receiving about half an inch of rain thus far this month, there’s about 100 gallons of rain harvested from this downspout. 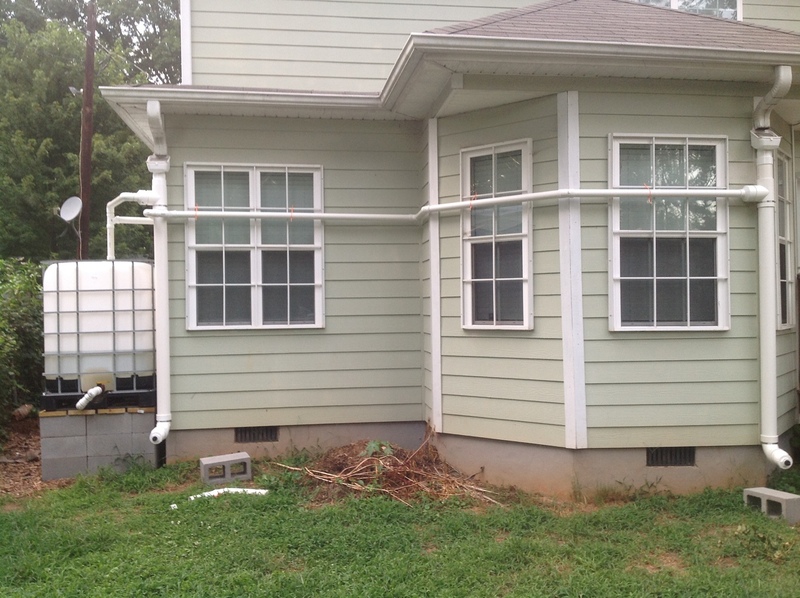 This second tote is hooked up to the downspout with the least rain output. That plus the leaf clogging I recently found, resulted in this tote only capturing about 10 gallons thus far this month. I was originally hesitant about harvesting rain off the downspout at the front of my house. However, after calculating that it was fed by the most roof area. I decided to install a third IBC tote on my front porch. The totes are 48 inches by 40 inches so they do manage to fit into most spaces. So far this month alone, this tote has harvested about 250 gallons of rain. The fourth tote was also installed in the front of my house, next to the garage. This tote has harvested about 100 gallons of rain this month. 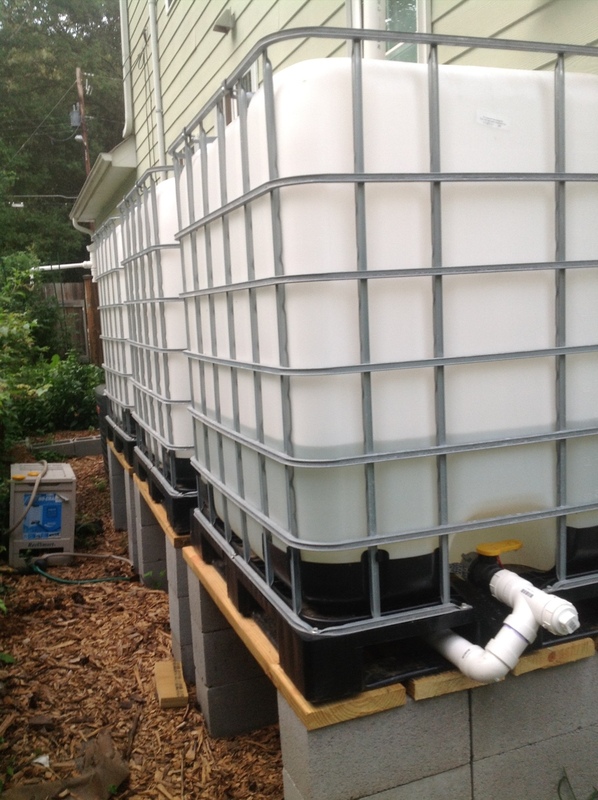 This remaining three IBC totes were installed in my west sideyard. This sideyard is only about 6 feet wide. I have a small, 4 feet by 20 feet garden in this sideyard since it gets full afternoon sun. My two A/C units are also installed in this sideyard, leaving about a 6 feet by 12 feet of remaining space in this sideyard. Since this space is not very usable, I decided the install the remaining three IBC totes in this dead space. These three totes are hooked up in serial so that the water only feeds into one tank but then will equilibriate through all three totes via hydrostatic pressure. I am experimenting with having two downspouts feed simultaneously to these three totes. This month alone, these totes have harvested a little over 100 gallons so far this month. So far this month, with a little less than half inch of rain, approximately 550 gallons of rain have been harvested. This about matches my expectations since 1 inch of rain translates to 0.60 gallons of rain per square feet, I would expect a maximum of 1,500 gallons of rain per inch of rainfall received. Each of the totes has been setup on three rows of cinderblocks in a U shape arrangement. Four pieces of 2 x 10 pressure treated lumber cut to four feet are laid across the cinderblocks to form a platform for the totes. Water weighs approximately 8 pounds per gallon. So when full, these totes will weigh close to 2,700 pounds. So far, this platform base setup appears to be more than adequate to support this weight. The cinderblock are 8 inches in height so the three stacked rows of cinderblocks raises the tanks by another 24 inches to provide additional lift for water pressure. 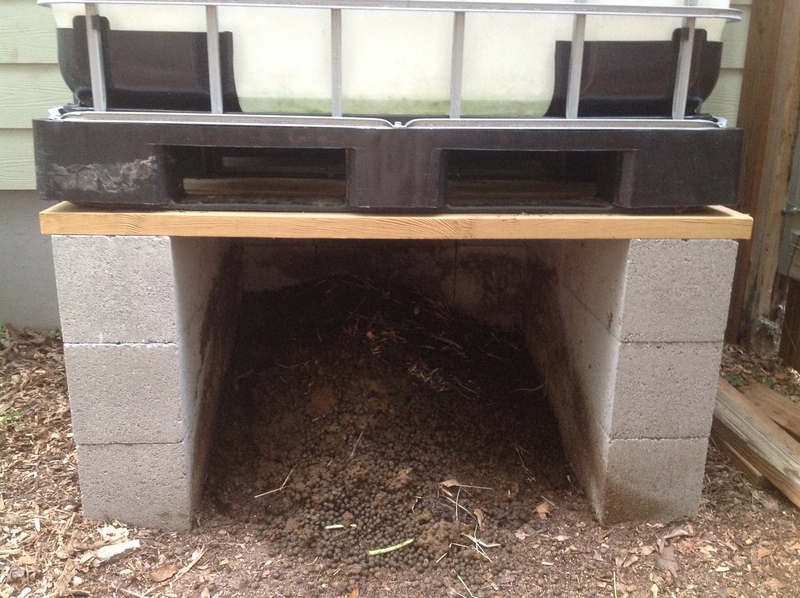 In addition, this is also intended to create a 24 inch high x 32 inch deep and 32 inch wide space underneath the totes which I am currently using as compost bins. 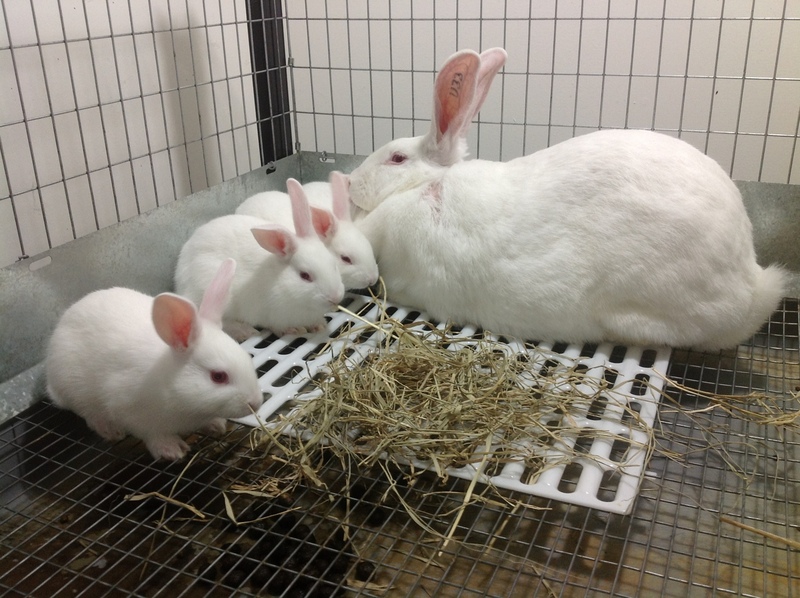 With my meat rabbit operation, I have a constant supply of rabbit manure. This is dumped underneath the totes and aged prior to use in the garden.